Relax. If you think a yoga session at a wine shop is going to involve uncorking bottles while doing downward dog or balancing a full glass while holding tree pose, you’ve got the wrong idea. 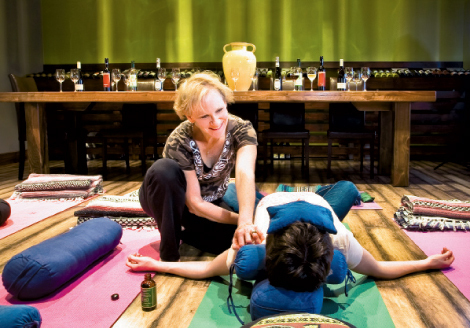 During Stretch & Wine, hosted at The Wine Studio of Asheville and led by instructor Diane Saccone, the vino comes after the restorative yoga session. That way, your mind is awakened and open to experiencing the subtle nuances of a lovely vintage. “After 45 minutes of restorative yoga, people are so relaxed,” says Jessica Gualano, owner of the studio. The hand and temple massages and aromatherapy elements add to that feeling. Once people’s senses are revived, it’s Gualano’s turn to lead a tasting of two whites and two reds. “I talk about how to listen to what the wine is saying. It renders people really present when they have to pay attention to what they’re smelling and tasting.” But, she adds, beyond perfecting a pose or critiquing a wine, the Sunday events are more about fun than anything. The class is limited to 12, so RSVP online or via phone.